Some like it in the pot, but all like it bold! Espresso, beside being a very popular coffee brew, is also the base for many great drinks. Here are 9 popular espresso based drinks and how to brew them. Think of everything you love about an espresso and how you make it. And you've got a ristretto – half the size of an espresso but twice as concentrated. Bolder, smoother, richer, and more intense than an espresso, a ristretto extracts the very best from your favorite espresso bean while leaving its bitter qualities behind. A ristretto, made using an espresso machine, is Italian for "restricted." While controversy abounds as to exactly how a ristretto should be prepared, everyone agrees that the goal is to get the most flavor from the coffee bean while restricting the shot in order to avoid the negative effects of over-extraction. Use 14 grams of extremely finely ground coffee beans. The finer the grind, the less easily water can pass through when the shot is pulled. Restriction is thereby achieved. Tamp the grounds very firmly, using a bit more than the 30 pounds of pressure normally exerted when tamping espresso grounds. Once again, water flow will be restricted during the extraction. Pull a short shot of about 15 seconds from the espresso machine, further restricting the coffee to only the first and best part of the extraction process. Always use only ½ ounce of water to produce a ristretto. Although step four is essential, usually baristas find that only one or two of the other steps are necessary for the creation of a ristretto. Some prefer not to use an extremely fine grind or an exceptionally firm tamp, reporting that these practices can clog the espresso machine. Some pull a full 30 second shot using the ½ ounce of water.  No matter how the method is varied for practicability or personal taste, the goal remains the same – to create a drink half the size of an espresso that does not contain the negative qualities normally extracted during the last half of the shot. Originally, one shot of espresso was limited to a single ounce simply because that was the maximum capacity of early hand-pumped espresso machines. Today's automatic espresso machines are limited only by tradition. Therefore, a single shot of espresso still consists of one ounce, usually consumed in a small cup called a demitasse. Modern espresso machines, however, generally have two spouts. When coffee is extracted, an ounce of espresso will pour simultaneously from each spout of the machine. Placing two separate demitasses, one underneath each of the two spouts, will catch two single one-ounce shots of espresso. Placing only one demitasse beneath both spouts will catch a two-ounce double espresso, otherwise known as a doppio. Use 14 grams of your favorite espresso bean, finely ground or as preferred. Tamp the grounds with 30 pounds of pressure as normal for an espresso and attach the portafilter to the grouphead. Place a single cup below both spouts of the espresso machine so as to capture the flow from both spouts in the one cup. Pull a shot of 20-30 seconds depending on the type of bean chosen. Now you have a doppio – a classic "double shot" of espresso. Since the espresso machine was invented in Italy, most terms relating to espresso and its consumption come from the Italian language. Caffé means coffee. Latte means milk. The caffé latte as enjoyed in American coffee shops may vary in size and proportions, but it is often made with a ratio of three parts of milk to every one part of espresso. Pull a double shot (2 oz.) of espresso into a warmed coffee cup. Steam six ounces of milk about 10 seconds using the steam wand on the espresso machine. TIP: The milk should be frothed ever so slightly so that it will stick to the side of the pitcher when swirled but NOT form a thick layer of foam. Pour most of the steamed milk slowly into the espresso, holding the coffee cup at a tilted angle to avoid breaking the crema. TIP: ​Hold the milk pitcher fairly high above the cup and gently swirl it while pouring to mix the stream of steamed milk into the espresso. Lower the milk pitcher and pour gently to produce an artistic finish. Caffé latte art includes everything from the classic heart to sophisticated swans and swirls that make it seem a crime to drink. But if your latte tastes smooth and creamy and was fun to create, then it can compete with the best of them. Best yet, without the use of sugary creamers, it's a luxurious drink that's healthy, too. If you enjoy a caffé latte but want to capitalize more on the espresso flavor, then you may be looking for a cappuccino. The cappuccino features equal parts of espresso, steamed milk, and foam. Steam and froth about four ounces of milk for 10-20 seconds using the steam wand on the espresso machine. Tap the pitcher of milk gently on the counter to break any large bubbles and create a more uniform foam. Pour the steamed milk slowly into the espresso, topping it off with the foam. TIP: ​Place the tip of the steam wand just at the surface of the milk in the pitcher in order to allow it to foam air into the milk while steaming. Again, to achieve the classic espresso, your finished drink should contain 1/3 coffee, 1/3 milk, and 1/3 pure foam in a beautiful rainbow of flavor. Check out this video on how to make a proper cappuccino. Still too much milk in your coffee? The classic macchiato is a velvety espresso topped with a little milk foam and nothing more. Once again, we owe the term macchiato to the Italian language – it means "marked" since the espresso is only marked by a dollop of foam on top. Steam and froth a couple ounces of milk and pour it into a warmed coffee cup, retaining most of the foam for garnish. Pull a double shot (2 oz.) of espresso. Pour the espresso slowly into the center of the steamed milk in the cup. TIP: ​Pull the steam wand away at about 140° Fahrenheit since the temperature of the milk will continue to rise to the desired 150° after steaming. Although a macchiato is traditionally supposed to contain only coffee and foam, many lovers of milk-based coffee drinks use greater quantities of steamed milk along with an array of flavorings or garnishes – and still call their coffee a macchiato. A flat white coffee combines some elements of a caffé latte and a cappuccino to create a distinct experience of its own. Some people view the flat white simply as a smaller-sized caffé latte. However, the flat white actually uses less milk in its coffee-to-milk ratio than a caffé latte in order to give it a more robust espresso flavor. However, the flat white does not capitalize on frothy foam as does the cappuccino. Steam four ounces of milk about 10 seconds using the steam wand on the espresso machine. Swirl the milk in the pitcher to create an especially uniform texture. Pour the steamed milk slowly into the center of the espresso. TIP: No large bubbles should be visible in the steamed milk. If necessary, stir or pour the milk from one pitcher to another to eliminate any frothy foam. A flat white, as described by its name, is not topped with foam, but may retain a dot of white milk in its center. The flat white is another great way to enjoy espresso for those who love its flavor but prefer not to drink it straight. If you ordered a "latte" in an American coffee shop, you would be served a milk-based, creamy drink with a hint of espresso – a caffé latte. If you asked for a "latte" in a coffeehouse in Italy, however, you might get only the milk. Remember, latte means milk in Italian. Essentially, in modern lingo the term "latte" is merely a shortened version of the term "caffé latte" – they are really the same drink. If you would like to change things up a bit, however, you can add some classic flavorings. Drizzle one or two tablespoons of vanilla syrup into a warmed coffee mug. Pull a double shot (2 oz.) of espresso into the mug. Pour the steamed milk slowly into the espresso and top with any remaining foam. Once you have learned to make and flavor espresso drinks, you will be ready to host (and impress) your friends. And now to turn that shot of espresso into a full-on dessert! The affogato originates in Italy as well, although almost endless flavor and garnish variations have been made as the recipe spread in popularity. Pull a shot (1 oz.) of espresso. Scoop just one scoop of vanilla ice cream into a chilled glass or bowl. Pour the steaming shot of espresso over the ice cream. Add toppings as desired and enjoy while the coffee is still hot. At this point, your creativity and taste preferences provide your only boundaries. Chocolate shavings are a favored sprinkle, but unless you're a coffee purist, you probably won't stop there. Nuts, berries, fruits, coconut... what sounds good to you? Just remember that although affogato is a supremely exquisite dessert, it is made using a full shot of espresso – so you probably don't want to prepare it as a bedtime snack. Now that we've mentioned chocolate, we can't end the list of espresso drinks without adding the mocha, inspired by the Bicerin from Turin. A mocha is essentially a caffé latte coffee with the addition of chocolate – and probably a bit of whipped cream on top. Also called a mocaccino, the mocha can be made using chocolate syrup, cocoa powder, chunks of high-quality chocolate, or even chocolate milk. Drizzle two tablespoons of chocolate syrup (or whatever form of chocolate you desire, including dark or milk chocolate) into a warmed mug. Pour the steamed milk into the espresso, layering it with foam. TIP: Add ¼ teaspoon of vanilla extract to the espresso for further flavoring. Alternatively, top the mocha with whipped topping dusted with cinnamon. Or marshmallows and chocolate sprinkles. It's really up to you. 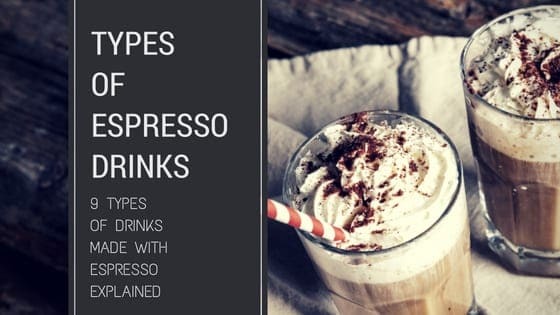 Now that you can recognize the most popular espresso-based drinks and understand what makes each one a distinct experience, you are ready to try some of them in your own kitchen. Remember, even if you don't achieve a classic drink the first time, enjoyment and experimentation have always been at the heart of an espresso. Previous Post Must Know About Coffee Cupping You Can’t Miss Next Post 10 Tips to Get Used to Black Coffee and Never Go Back!